Click the button below to add the New 4 Channel Zmodo HD 720P with POE Camera System 1TB Drive to your wish list. New Zmodo HD 720P 4 channel surveillance system. If you are looking for HD camera with POE they are more costly but worth the price. Now Monitor your home or business with levels of clarity and details never before this 4 channel complete POE NVR system. Just activate the power of the NVR, power of PoE, plug into the four PoE ports, the recorder will start recording right away, and no need other power devices. Power over Ethernet technology makes power to a lot of saving and more stable pure digital video streaming. Did you know that you can power your IP cameras through your NVR? It's true! 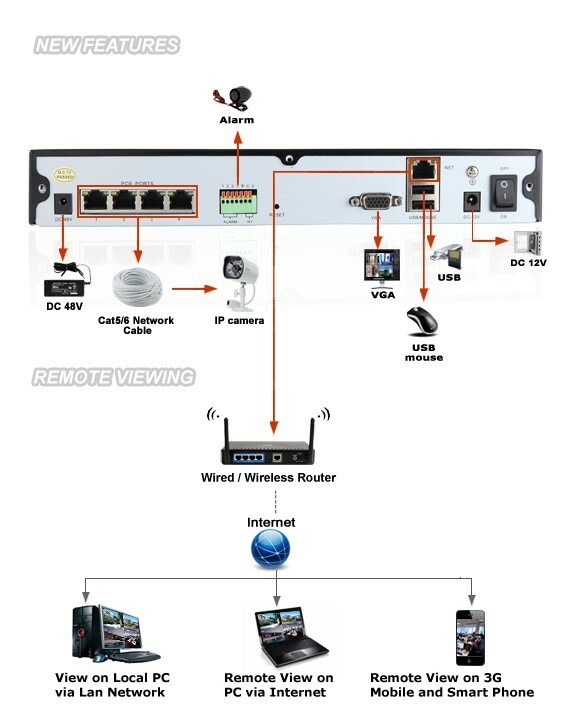 If you have an NVR wired directly to your router, there is no need to run a separate power cord!With four Power Over Ethernet(POE) ports, the same network cable can deliver not only video but also power from each IP camera to the network video recorder. No need to run separate power cable or power equipment. With three times the resolution of standard analog video, the 720p NVR allows you to record more of the scene without losing any detail. The megapixel cameras included in this pure digital recorder kits can see more of the room than standard analog security cameras, which will help you save money by installing fewer cameras and still monitoring the entire scene. This system allows you to view your footage, no matter the time or location. Access your DVR’s footage over the internet, or directly from your Android™, or iPhone® smartphone. or your PC. These IP66-rated cameras can withstand extreme wind, dust, and rain. These cameras are suitable for outdoor use, even in rugged climates. Network protocols TCP/IP, UDP, DNS/DDNS, SMTP, UPNP,DHCP, HTTP, FTP, etc. Have not yet mounted the cameras. Thought it best to let the system burn in before running all the wire then not being happy with the product. So far so good, system booted-up and everything works good. No included manual, would have preferred an hard copy manual. All in all pretty self intuitive set up. Time will tell if poe was the way to go. I LOVE these cameras. They are so much better than the other system I got at the local big box store, and practically the same price. They do cost more, but they're worth every penny.